Thanks to technology culled from across Alibaba’s vast network of companies, most notably Fliggy, Alibaba’s online travel platform, guests can immerse themselves in the crossroads of hospitality and technology. As Skift reports, it all starts with booking through an app, where guests can pick a floor and a view, exploring the minimalist room. Check-in is a breeze, too, especially for Chinese guests who can use the app to scan their faces to expedite the process (for now foreign guests must use lobby kiosks). No need to pick up a key from the lobby, because the elevator will scan your face and take you to the correct floor, and your face will open the room door. Once inside the room, requests for water, new towels, extra pillows, and more will be taken by Ask Genie, Alibaba’s Alexa-like assistant, and a three-foot tall robot will deliver the goods. Too hot? Too cold? Too many lights? Ask Genie to shut the curtains or crank up the heat. Hungry guests can head to the hotel restaurant where a robotic bartender is mixing up drinks and food ordered via the FlyZoo app will be delivered by other robots. Forget your wallet? 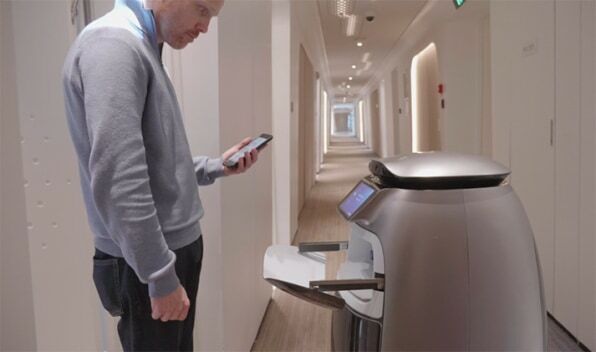 No problem: Face-scanning technology will send the charges straight to your room bill. The hotel’s technology is impressive, because as Skift notes, Alibaba had a lot of tech to pull from: There’s Fliggy providing user experience design, Damo Academy for artificial intelligence, data analytics labs, and robotics, and Tmall Marketplace for marketing. This isn’t the only hotel giving guests a glimpse of the future: Last year, Fliggy and Marriott International teamed up to pilot a facial recognition check-in program just for Chinese guests, at two Marriott properties in Hangzhou and Sanya. Marriott is also developing high-tech showers, Hilton is taking a phone-based approach to smart rooms, and InterContinental is using Baidu’s artificial intelligence tech to create smart rooms also aimed at the Chinese market. While Alibaba hasn’t made forays into the U.S. market yet, Amazon is already here with its push into Alexa-powered smart hotel rooms. All this technology lets hotels give guests more tailored experiences, allows for seamless delivery of services, and faster check in—and hey, robots are cool. As the use of technology at airports has shown, though, it’s pretty clear people are willing to give up a little privacy for more convenience and speed.